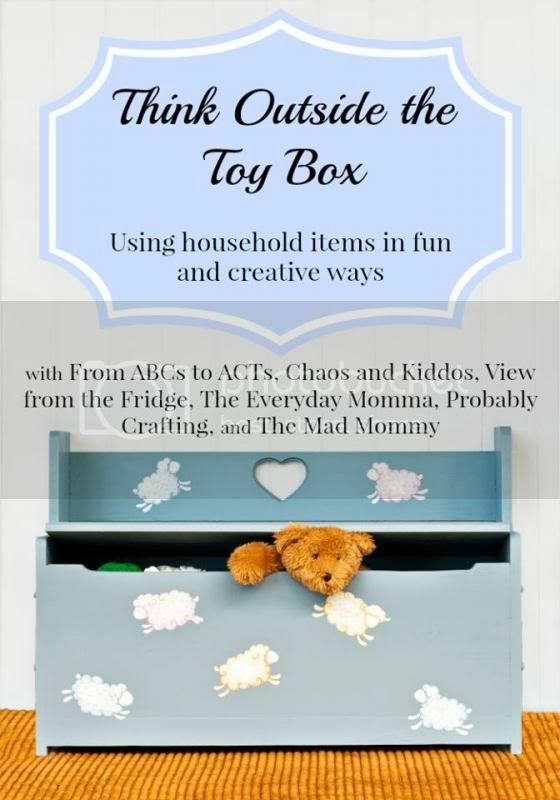 Hello all, it's Monday and that means it is time for the Think Outside the Toy Box Summer Fun Series! I have been single parenting (24/7 mom duty) for the past 10 days and I have 3 more to go. I was good for the first 5 days, but now I'm not sure what day or time it is, what direction is up, or what I ate for breakfast. 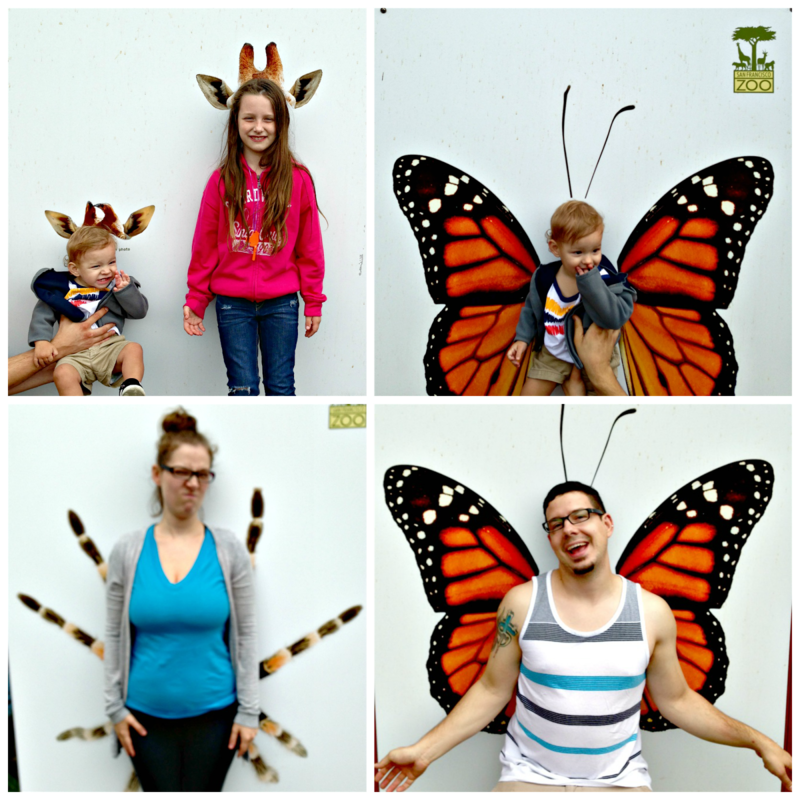 However we did manage to have fun with this week's project and I am excited to tell you all about it! I had an idea for pool noodles circling its way around my brain since the beginning of this series. My inspiration came from the second story walk way we have overlooking the entry way and dinning room in our house. 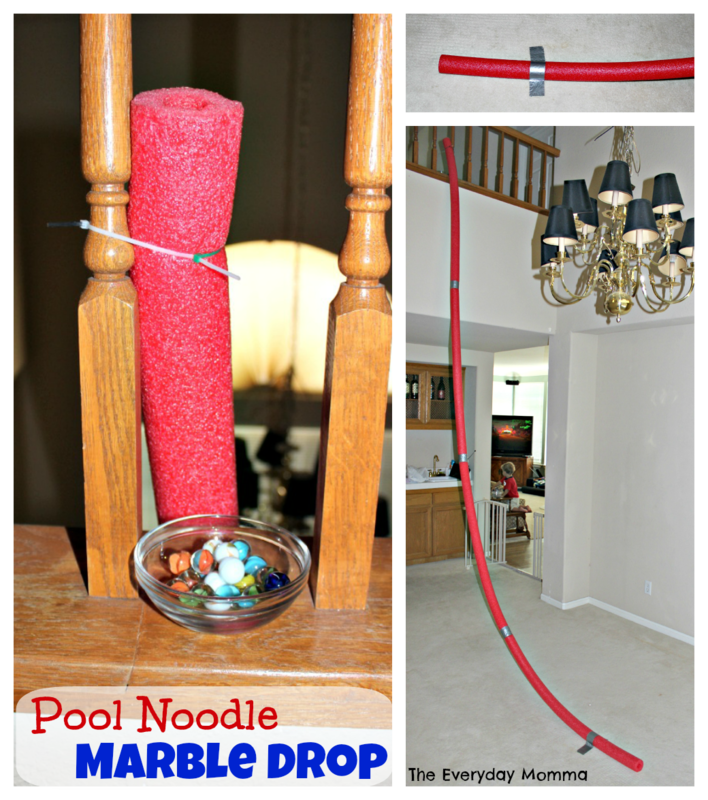 I thought how fun would it be to drop marbles down the noodles from the top of the walk way to the floors down below. 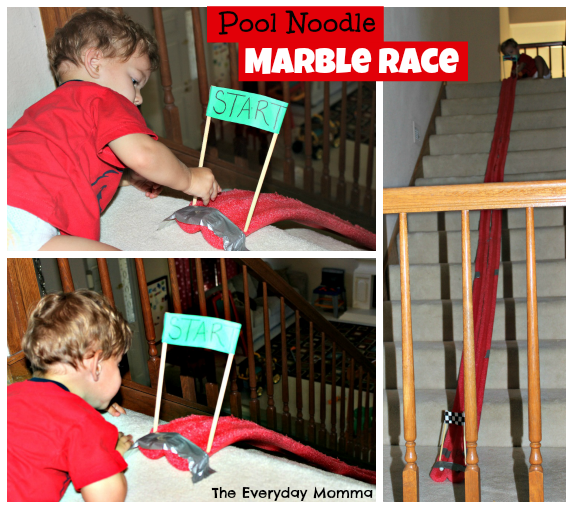 That was the beginning of my idea and then I saw the pool noodle marble race on Pinterest, so I thought we would try that out after the marble drop. 1. 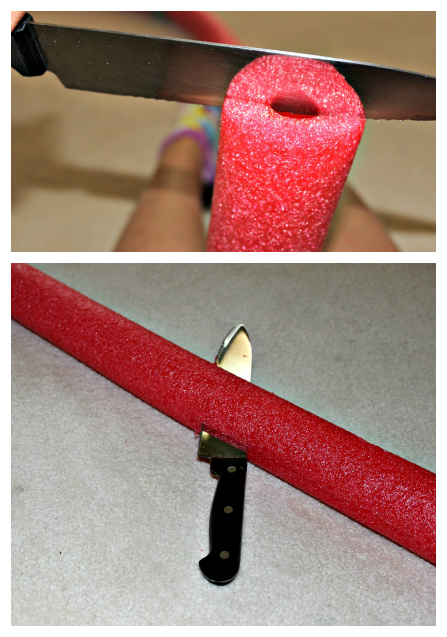 Start by taping the pool noodles together with duck tape. 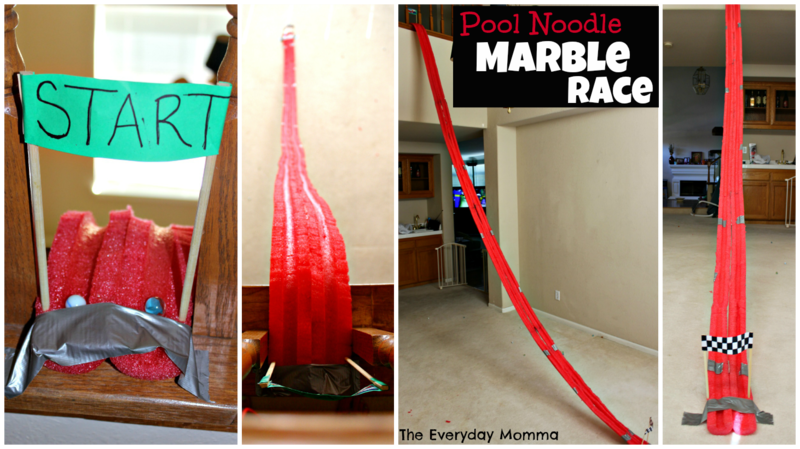 I used four noodles, but you may need less based on where you will be setting up the drop/race. 2. 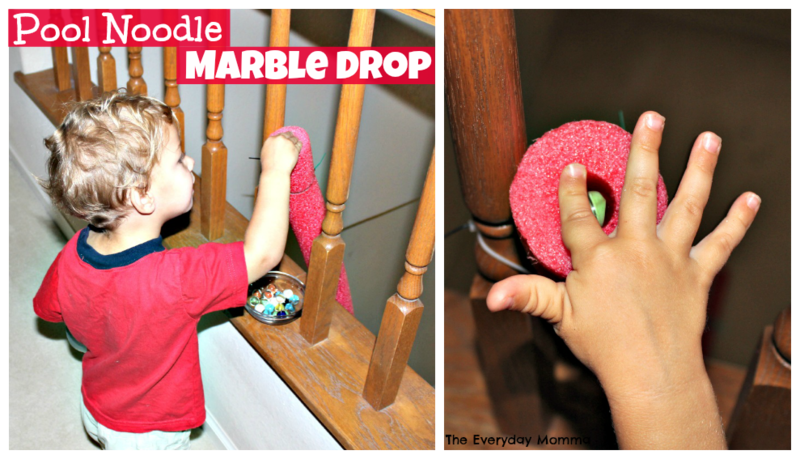 Before I got to making the marble race, I made a marble drop for Myles to try out. We have high ceilings, so I was able to hang the noodles from the second story walk way and let them drop to the first. I attached them to the top banisters with zip ties. I dropped the noodles into our unused dining room and secured them to the ground with a piece of duck tape. 3. Drop the marble down the noodles and watch it come out down below. 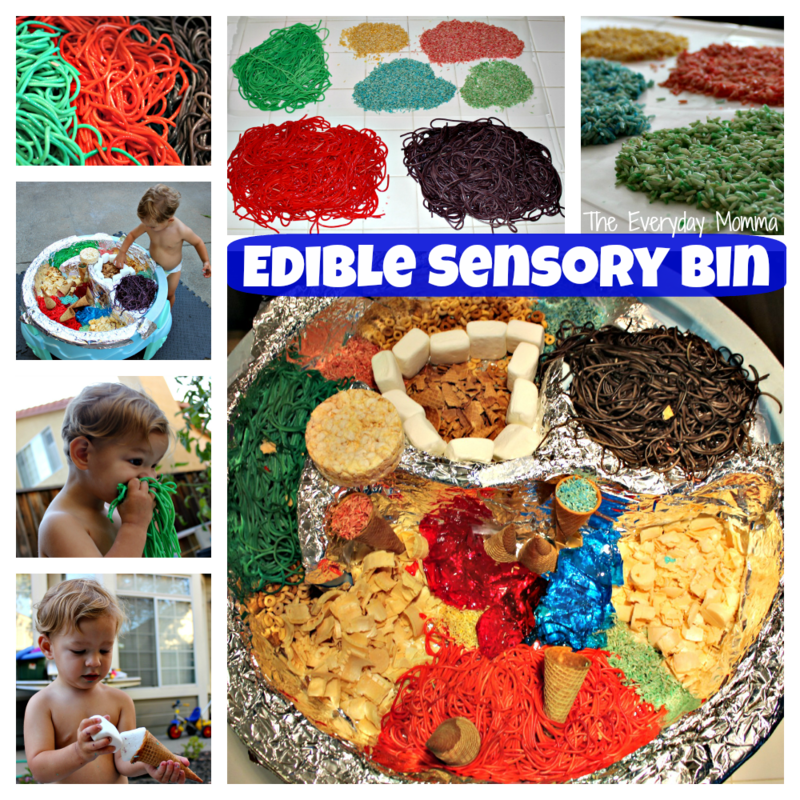 This is an awesome way to work on fine motor skills with the young ones. I'm pretty sure Myles could do this for hours and I kinda totally had fun too. You can also have a 'competition' with the marble drop; if you have a big, open space at the bottom, see whose marble goes the farthest after coming out of the bottom. 4. 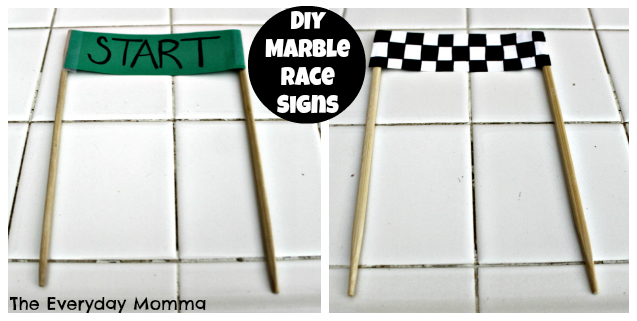 Now to make the marble race 'track': use a knife or sharp scissors to cut the noddle(s) in half. A non-serrated knife would be best because I noticed with mine, the edges were really rough. Also take your time and make sure you are cutting straight down the middle the entire time. I'm sure it is easier with just one or two noodles, but since I had four, I ended up getting a little off track a couple times. It still worked, but at some spots the indentation for the marble to go in got really shallow. 5. Optional: Make the start and finish line banners. I just took some scrap paper I had and made two signs: one green for the start and one checked for the end. I attached them to chop sticks with tape. I've seen toothpicks and skewers used as well. 6. Since my track was really long, I had to find a way to keep them side-by-side. I thought about it for a while and came up with a couple ideas to try. First was a hot glue gun... let's just say, that didn't end well. I was excited because at first it was working great but then as I was holding the sides together while the glue was drying, I noticed parts of the noodle were gone. Weird.. but I just kept going, then it finally dawned on me that the glue was getting so hot that it was melting the plastic noodle! I tend to not think things through... Then I thought I would try rubber bands. That didn't work because the rubber bands weren't high enough to let the marble through. Then I just resorted back to my original, but boring idea to just duck tape the under sides together every couple of feet. I wasn't sure how well this would work, but in the end it was the best option. I also duck taped the top to the banister and the bottom to the carpet. 7. Putting it over the second story walk way looked cool, but was not practical. It was too steep and the marbles kept falling off before they got to the end. So we decided to move it to the stairs. This way worked perfectly! 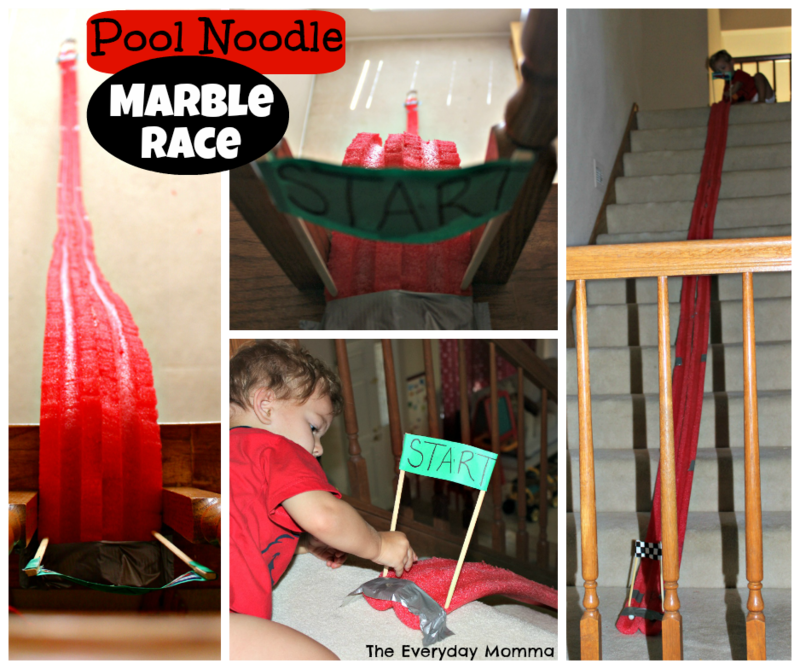 Seriously hours of racing fun: great for working those fine motor skills for the young ones, and a little friendly competition for the older ones! 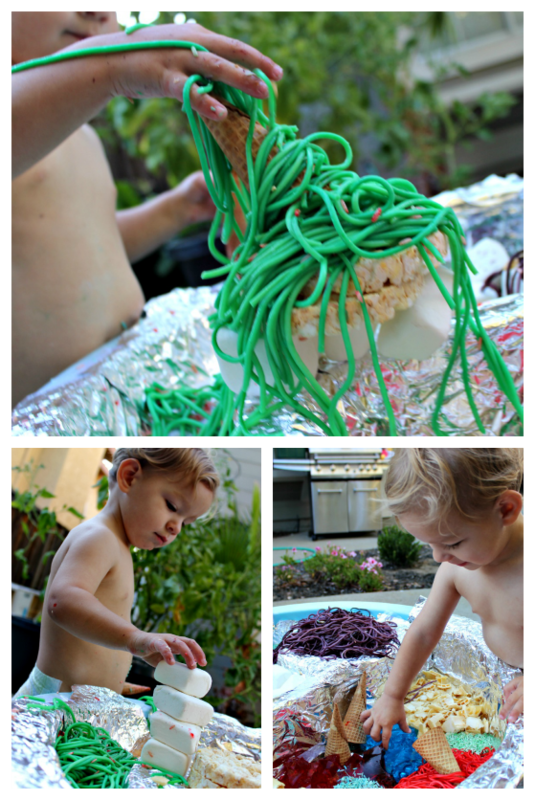 And that was our week six of the Think Outside the Toy Box Summer Fun Series is complete! Also don't forget to check out what all of the other ladies put together for this week's item in the link-up below. 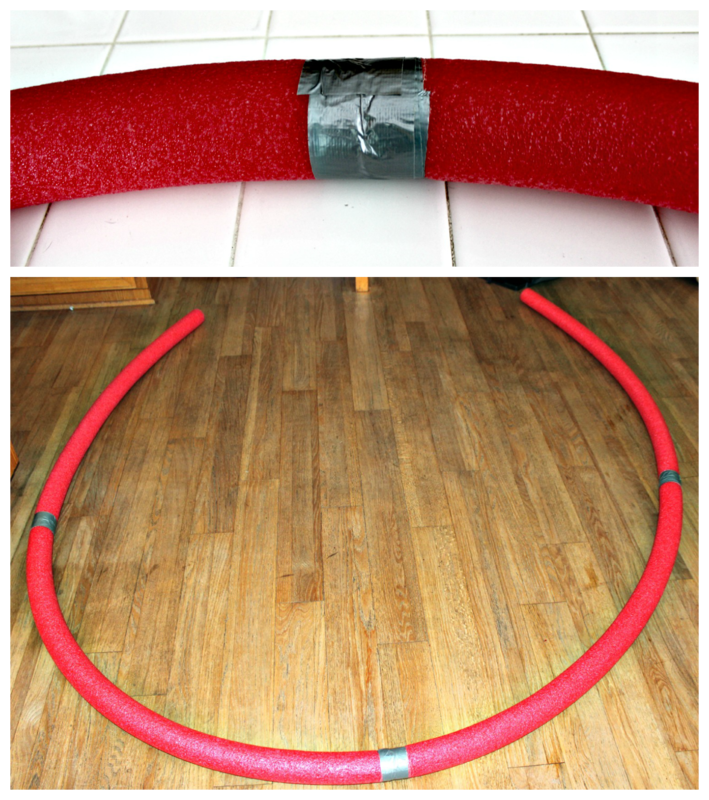 And if you have a post (new or old) that you created showcasing pool noodles in a kid's project, craft, game, experiment, etc., submit it below as well. No post this week? 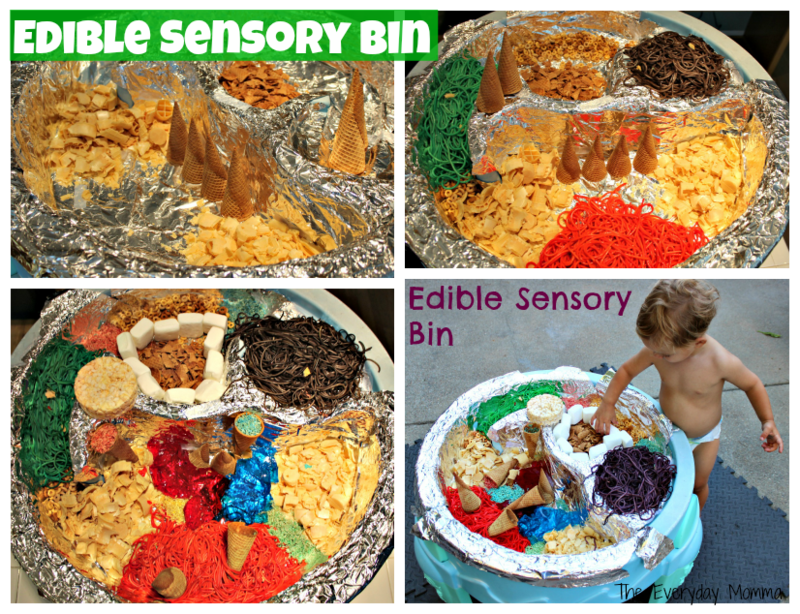 No problem; join us next Monday when we will be using Wax Paper! 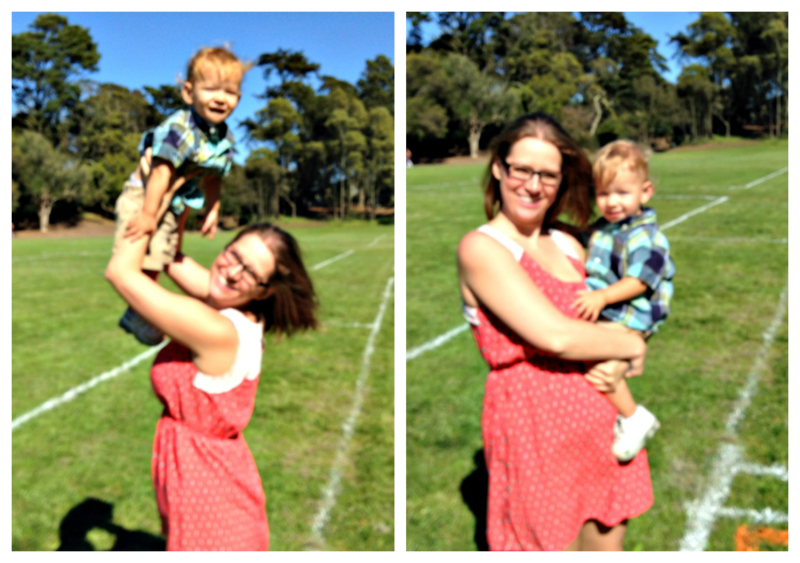 As you may know, I didn't decide to start my blog until my son Myles was about 8 months old. And well... now he is 22 months old! I'm still trying to get caught up with the monthly updates and monthly favorites, so I can get, and hopefully stay, up to date. Absolutely nothing to report this month and that makes me one happy momma! Still on the thinner side and not quite fitting into the waist of 12 month bottoms. He definitely has a longer torso and shorter legs because even some 12 month shirts looked a little short on him, but 12 month pants were fine in length. He still had only 6 teeth (top middle four and bottom middle two). Also happy to say his brain is perfect, based on the fact that he was obsessed with his Packer's book! Myles had his first bully experience at the playground. He wanted to play with the water and this boy kept yelling at him saying "no" and "get away". I didn't think he would understand what was happening but he looked at me, starting crying, and ran to me. It seriously broke my heart. And I know this is just the beginning. I hope he is stronger than me. 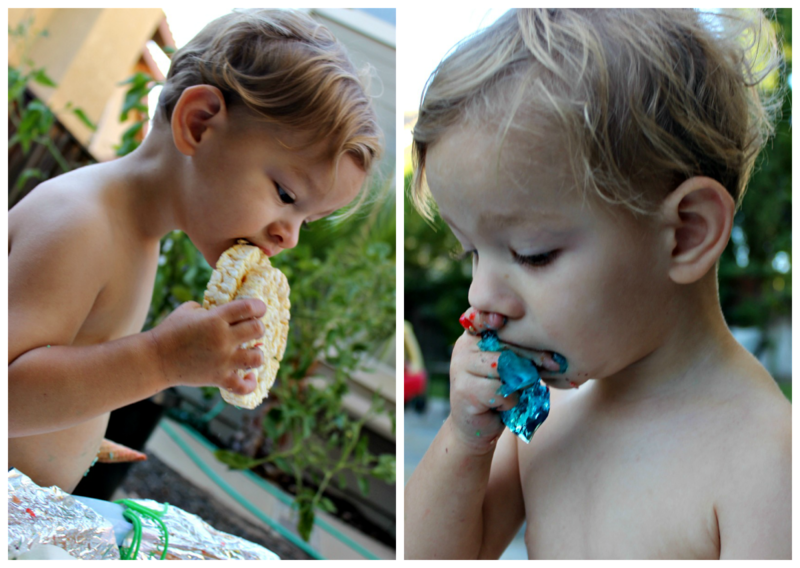 I also let him try out whipped cream with his jello for a first day of Fall treat. Safe to say, it was a huge success! Still going well in the sleeping department. I certainly could not complain, considering where we were 7 months prior. Sleeping from 9pm-7am, then nursing in my bed for about 30-60 minutes. If we were home for the day (or most of the day), he would take one long nap around 12pm-2/3pm. We would lay in our guest bed and he would nurse to sleep and throughout his nap. If we were out and about during the day, he would usually end up taking 2 short naps (30 minutes each) in the car. At bedtime, he would nurse for about 10-15 minutes, then I would kiss him, and lay him down awake in his crib; no nightlight, but ocean sound machine running. Concrete slide that you ride down on on pieces of cardboard. 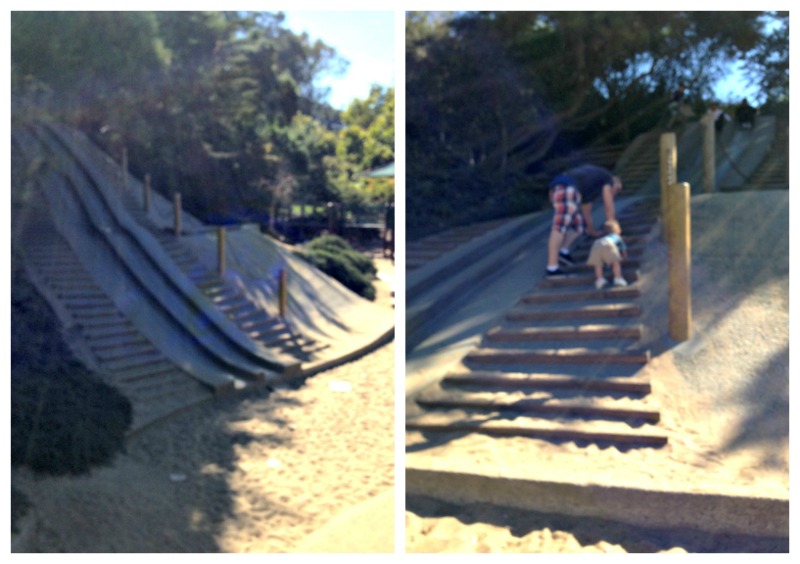 Mark took Myles up and then back down. They also have a carousal, so of course I had to get Myles on a horse/zebra. 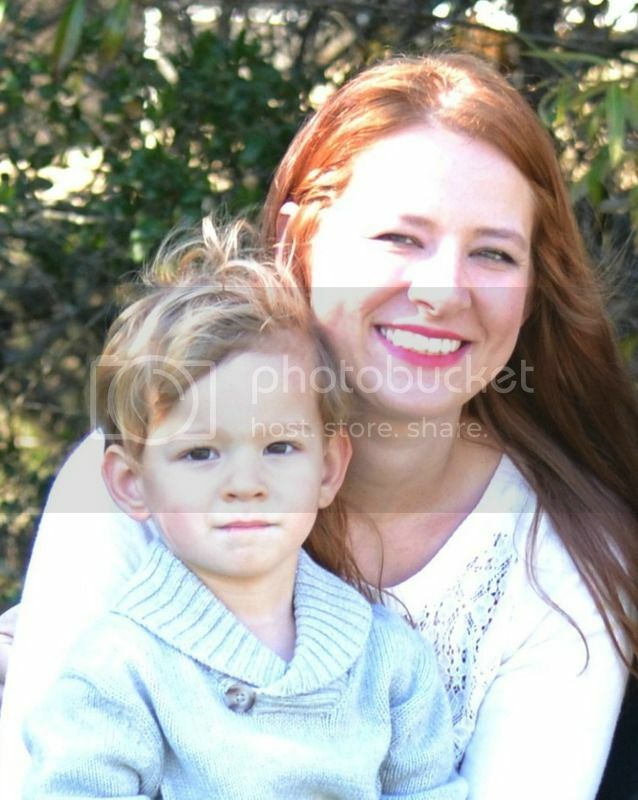 Just a little photo shoot with my man. They have two huge play structures, tons of swings, a big sand area, and this spot with a lot of plants and some really cool art sculptures. Mark had his 30th birthday this month and we had a nice dinner at Skates on the Bay in Berkeley. His cousin lives there and suggested it to us. 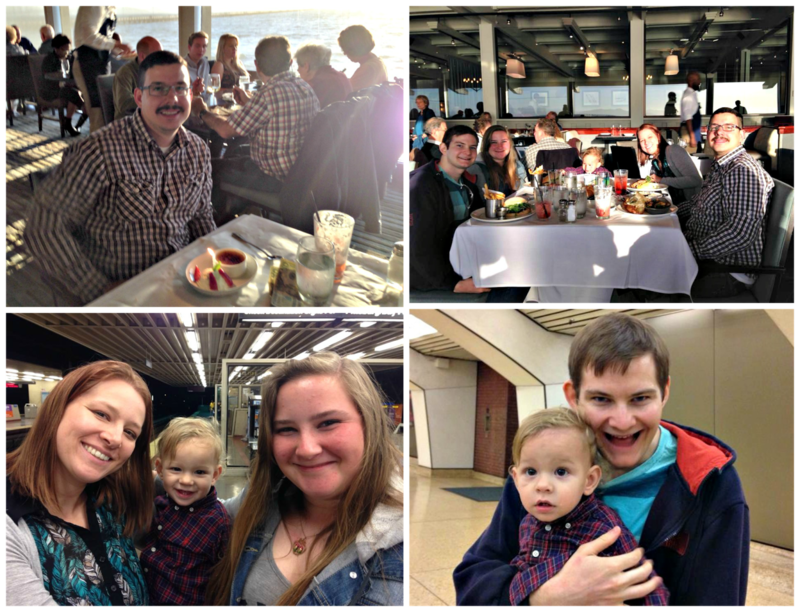 Stunning view of the Bay, good food, and great company made us all happy campers. Of course Myles wasn't into waiting so I took him outside to check out the rocks and waves. He thought it was the coolest thing ever. He was laughing and smiling every time a wave crashed into the rocks. 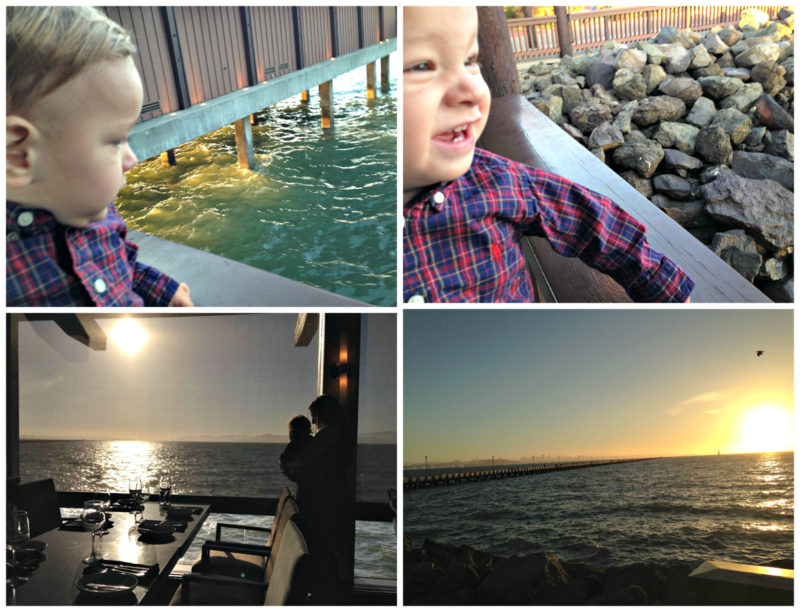 A lover of the ocean just like his momma. Still going to the park regularly, usually at some point every day we would find ourselves at the park. I just couldn't get over the beautiful weather and since that was the main reason we moved to California, I wanted to take advantage of it as much as possible. I caught this little moment one time and just had to share. He always went for older girls to play with and they would always want to play with him too. His ball skills were growing by the day as well. He was learning to kick, throw, and bounce the ball, however his most favorite was still just carrying it around all day everyday! Clapping: a little late to this game, but he learned how to clap. My mom sang "If You're Happy and You Know" to him a lot on Skype and one day he clapped with her! After that he would do it whenever you asked him to clap. Other new skills: wiping his face with a napkin, waving again (he did this when he was younger but stopped after a couple weeks), says bye with the wave (but only after people are gone), splash in the tub when you say "splash", and bring most any toy/book I ask for. However still no kissing! This happened when I was putting together our Halloween Mantel. Of course Myles had to 'help' and so I wrapped him up in the fake spider webs. Ducky party in the bath tub. He had tons of other bath toys, but he always favored his ducks, so one day I got all of his ducks together and gave him a duck only bath. Wheelies: this was his new favorite way to ride his bike. He would pull it back so that it was resting on the bucket and steering pole and then get in the seat and just hang out. Somehow he managed to stay in there even though he was at a 90 degree angle! Come back to check out my favorites from months thirteen & fourteen! Things continued to go fairly well in the health category this month. He did get a little cold in the beginning of the month. 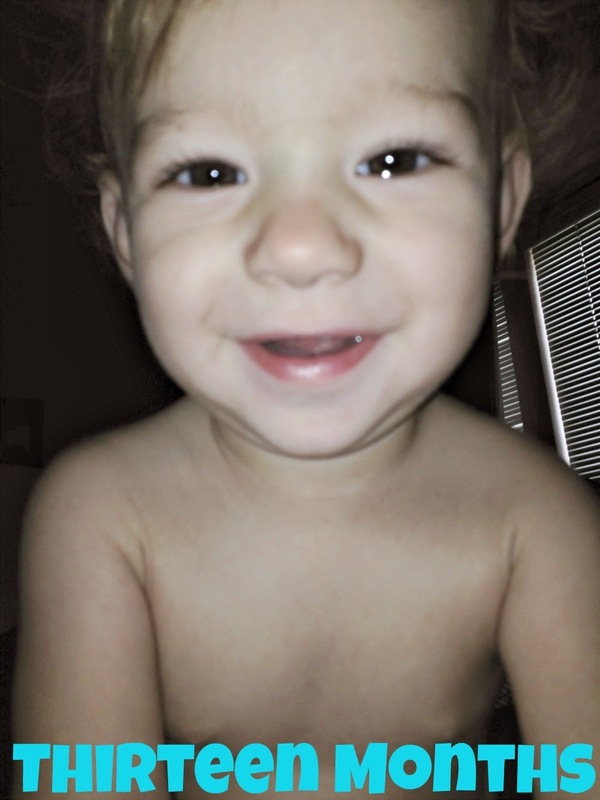 Right before we left to go back to Illinois for his first birthday, he started getting a runny nose. It continued for about 4 days into our trip, but was completely gone by the day of his party. He also had his 12 month well-check while we were back home. Everything went well and he was right on track. I decided to push back his 12 month shots since he already had a runny nose and his party was only two days after his appointment. He has had a bad track record with his shots, and even though the 9 month ones weren't too bad, I didn't want to risk him not being 100% for his party. Our doctor was fine with it, knowing that he wasn't going to daycare or anything regularly. Love me a big Buddha baby belly... althought it was steadily shrinking since he started walking! Eating was going better with each passing month; very slow, but steadily eating more at a time and trying more foods. 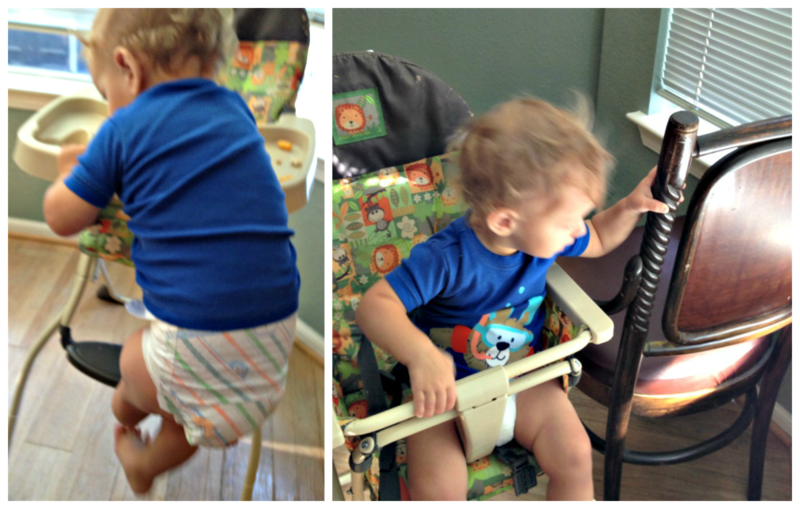 Last month I talked a little about how getting Myles to eat a significant amount of food was a big challenge in our house. We saw some big improvements during month 12 and although he still wasn't eating 3 meals a day, we were happy with him eating dinner every night. He still wasn't into breakfast at all, but he would sometimes snack at lunch, and mostly always ate dinner. He was still breastfeeding throughout the day, so I wasn't worried about him not getting enough nutrition or anything. He always drank a lot in the morning, so I am guessing that's why he never wanted breakfast. He was still nursing anywhere from 5-10 times a day. Morning, nap, and before bed were the times that he would drink a significant amount. The other times were short 5-10 minute sessions because he was upset, got hurt, was bored, etc. 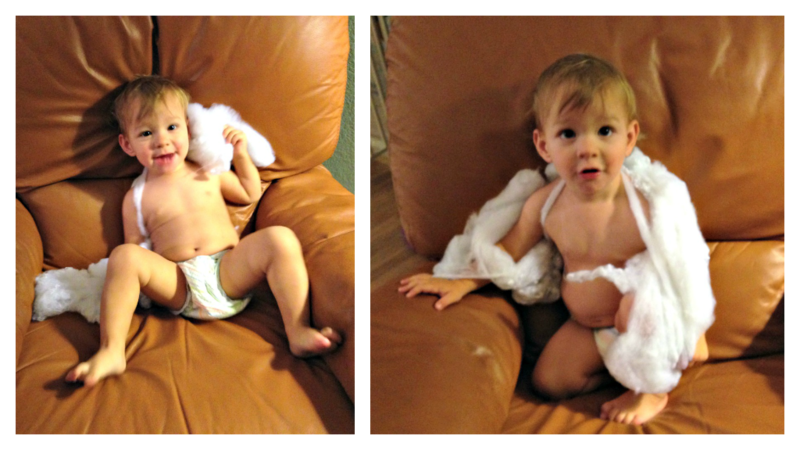 After making it a whole year breastfeeding, I didn't really know where I was going to go from there. I had never imagined I was going to make it to a year, so I didn't have any goals or expectations past that. 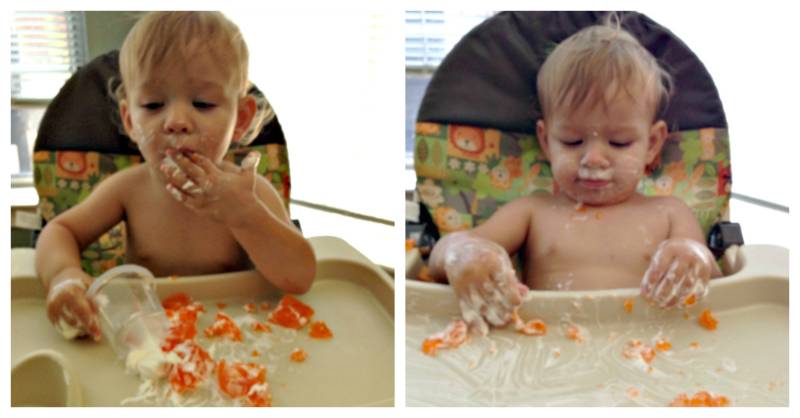 At this point, I decided I was just going to keep going as long as he wanted it, and think about weaning if he was still nursing when he turned two. I knew I would still be comfortable nursing him up until two, so I figured it would be best to let him wean at his own pace and then see how I felt about nursing past two when we got closer to that time. And to be honest, I was pretty sure I didn't have a choice with his level of attachment. He also really started mastering the straw. He learned how to use a straw months back, but now it was his preferred method of drinking! With such big changes last month, I wasn't sure how traveling and staying back at my parents' was going to go. I was pretty nervous since he had just started sleeping 10 hours straight at night (up from his normal 8 and then nursing back to sleep for another 2 hours). I was also not sure how a time change would effect his sleep. Since I had literally gone 8 months on 0-3 hours of sleep a night, this new sleep routine was too amazing to risk messing up. But we had to go back for his birthday, so I had to just hope that he would take the changes with a grain of salt! And thankfully he did!! Most nights I let him stay up a little later than his normal schedule, but we were visiting family and I wanted him to get as much time in with them as possible. So he was sleeping more like 10pm-8am, but still getting one 2-3 hour nap each day. On his birthday party day though he was so excited and pumped that he didn't take a nap all day! Around 7pm, when everyone was gone, he got really tired, but by that time I didn't want him to even take a nap, so I let him sleep for like 20 minutes and then woke him up to play for a bit before I put him to bed for the night. Getting some snuggles in with daddy before mommy put him to bed. Discovery Center Children's Museum; I make it a point to go here at least once every time we go back home. I never thought it was the greatest, but now after going to many others out here in California, I have realized just how awesome it really is. I could go on for days about this place, but my favorite part is the Tot Spot. It's just for kids ages 5-under and has everything a toddler could ever want to play with! 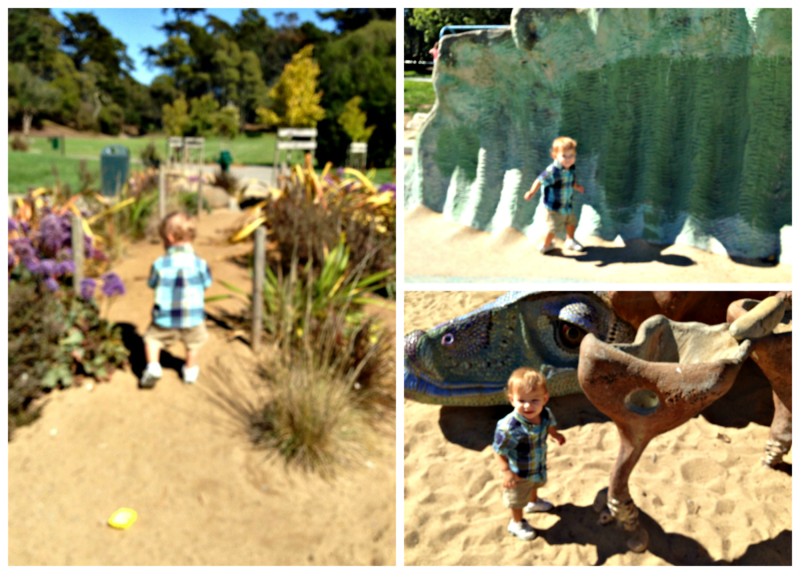 Myles could spend his whole day there if I didn't make him explore other parts of the museum! I didn't really take any good pictures because I just wanted to spend time with Myles, but his favorite part this visit was the water exhibit. 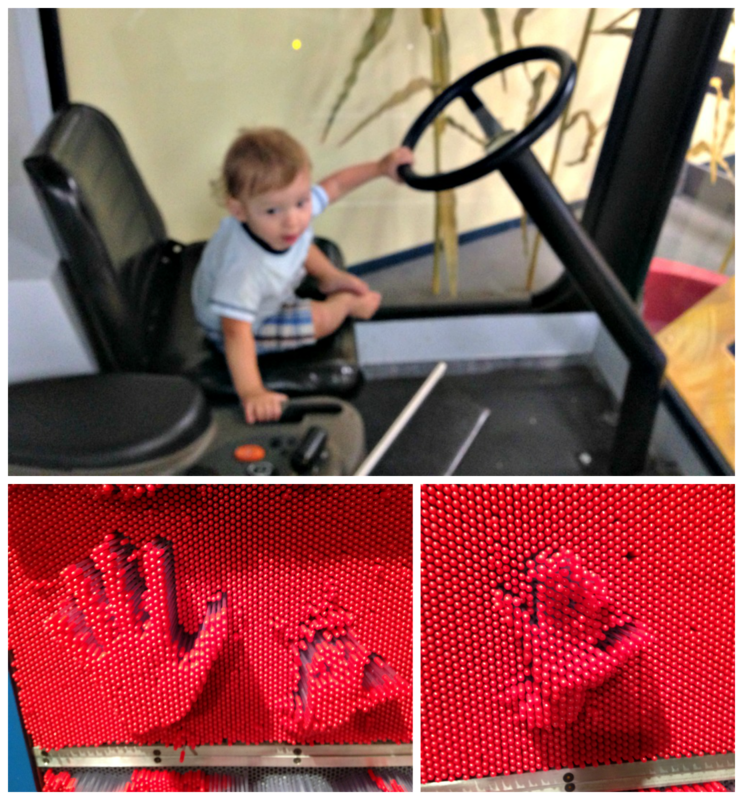 He also got to ride a huge tractor and we made our hand imprints together. San Fransisco Zoo: One Sunday we decided to take a trip to the San Fran zoo with some friends. 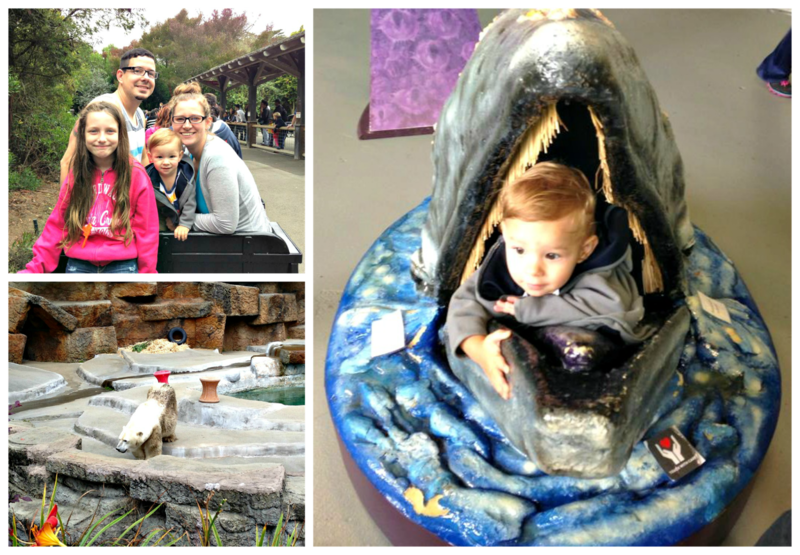 I am a big zoo/aquarium person and I was expecting this one to be amazing! I think my expectations were way too high and I definitely walked away disappointed. 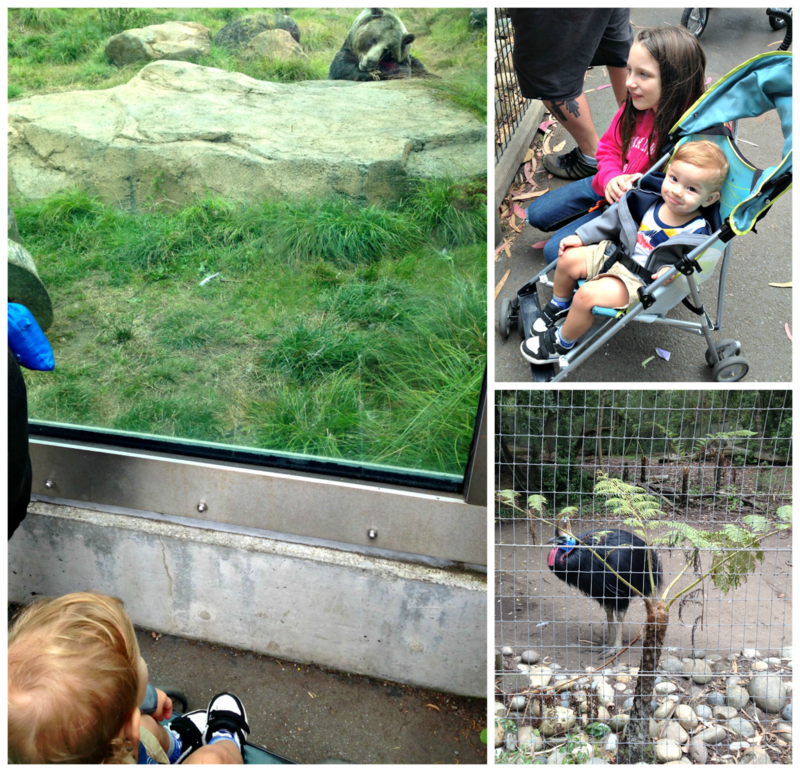 It was an okay zoo, but for the price and location, I thought there would be a lot more. A lot of the exhibits were closed and I wasn't impressed with the ones that were open. But the kids still had a great time and that's all that matters really. We also started taking him to the daycare at the gym. This was the first time he was under the care of someone that wasn't my parents or sister-in-law! I was really not prepared to do it, but since we had moved away from everyone that helped us with Myles before, I had to get a break and take time for myself somehow. The first 2 weeks were rough. He bawled every time we left and pretty much cried the whole time. The situation ended up being more stressful than helpful. They had to call us down to get him most times after about 30 minutes. I dreaded going and almost wanted to quit. But I kept at it just hoping it would get better soon, and it eventually did. He found a girl that he really liked. She had to hold him the whole time, but he didn't cry with her. So we just made sure we went when she was working. Little Gym: he really started blossoming there. He loved trying out all of the skills and of course ball time was his favorite. He had really awesome upper body strength; even the teacher couldn't believe how strong he was on the bars. This picture is him hanging from the bar. I know it's hard to tell but he is really hanging and not touching the ground. On the way back to California, Myles got his own seat on the plane. It is so nice when the plane isn't full and we get that extra seat. He sat on his own for a while and I had to get a picture because it was so stinkin' cute! 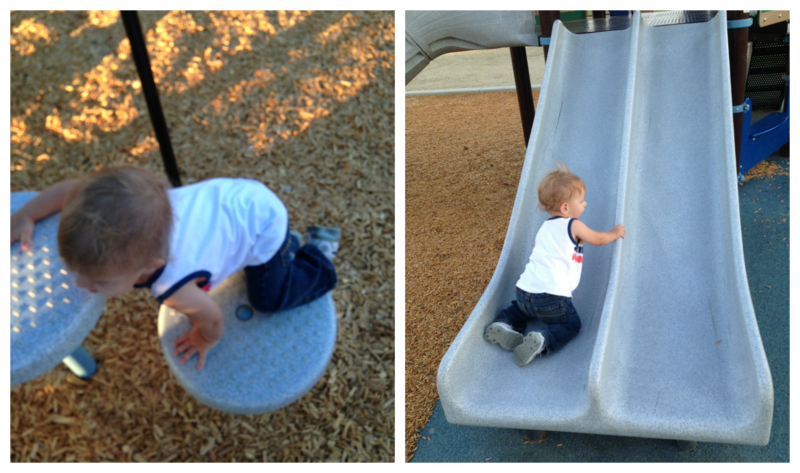 He also acquired another new skill at the park: going down slide by himself! He could climb up the stairs, sit down, and slide all by himself now! Big boy status! He loved brushing his teeth! Once I showed him what to do, he never wanted to stop. 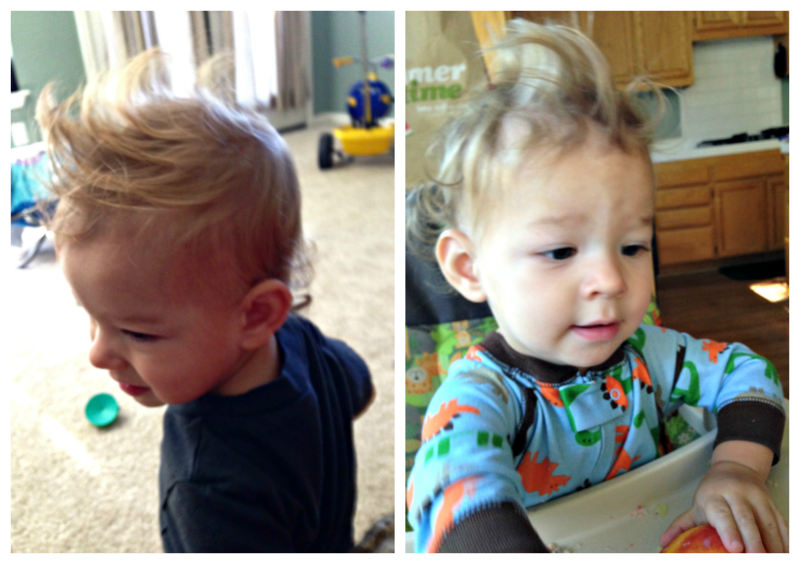 Now that he is developing his personality, I think I will be keeping this new category around! This goofy guy always had me laughing at his antics! This day he felt like taking his AlphabetPal for a ride. 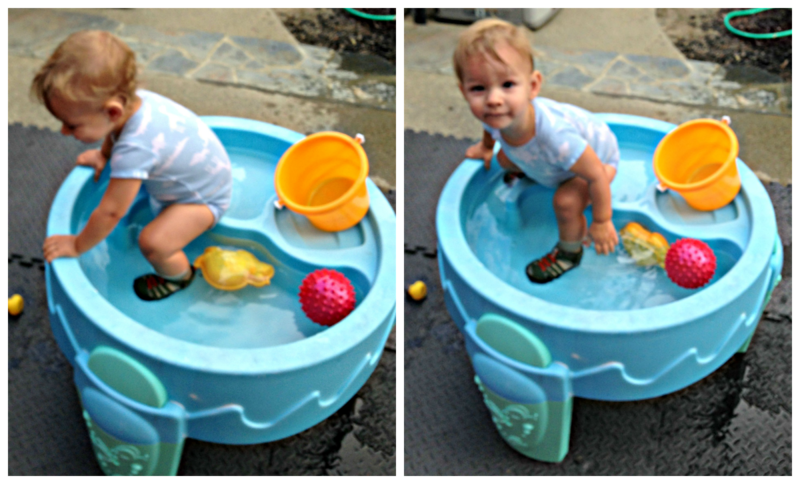 He loved playing outside in his water table. One day he decided to use it at a pool! He thought it was so cool, he tried doing every time we went outside! He started getting into the phase where he had to help do everything, most notably sweep and vacuum. Every time I got out the vacuum or broom, he had to take over and do it himself. He liked this play vacuum for a couple weeks and then he was over it and only wanted the real thing! This week marks the halfway point of the Think Outside the Toy Box Summer Fun Series. It feels like we've done so much already and participating in this series has helped keep our summer interesting and exciting! I have loved planning and creating each project for Myles and he has definitely had a blast being my little helper and then trying everything out! 1. The night before, make all the food that needs to be prepared. For me that was the jello, rice, and spaghetti. Prepare the jello using the directions on the package. 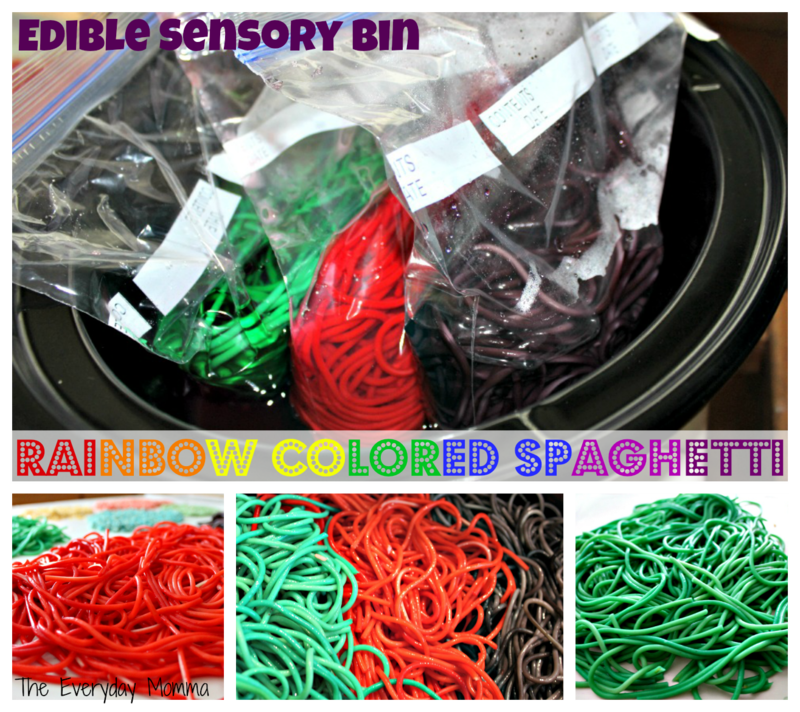 Spaghetti: Cook the spaghetti according to the package, but add 3 extra minutes onto their time. Drain, rinse, and let cool for at least 15 minutes. 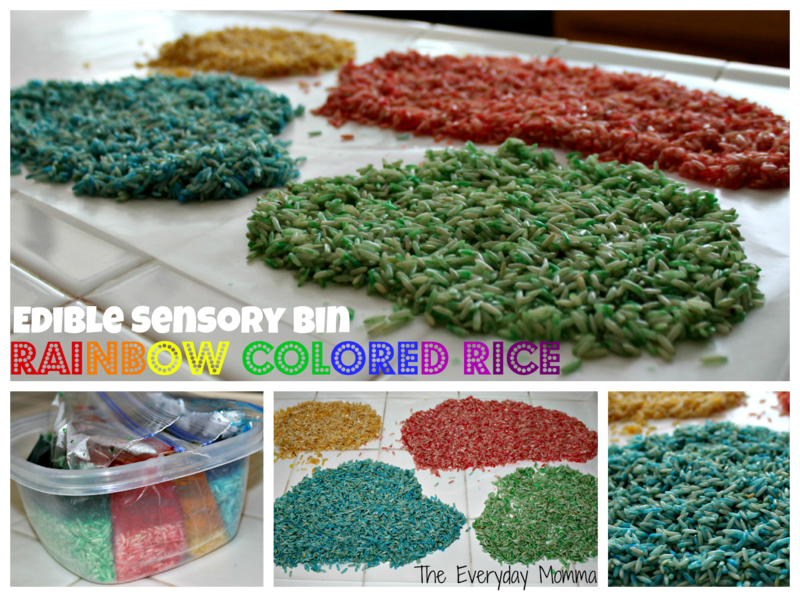 For each color you want, you will need a gallon Ziplock bag. Fill the bag about 1/4 the way with cold water. Then add either the food coloring or Kool-Aid. I used food coloring for the green and Kool-Aid for the purple and red. I used 2 packets of Kool-Aid for each bag and about 7-8 drops of food coloring. Add the spaghetti and close each bag. Let them soak overnight. Rice: The rice is made the same way. I figured Myles wasn't going to eat the rice, so I didn't cook it. But if you do, just cook according to the package, drain, rinse, and let cool for 15 minutes. For the rice, I used smaller sandwich baggies. I filled them 1/3 of the way up with water and added the food coloring. Then I added the rice, closed the baggies, and let them soak overnight. 3. 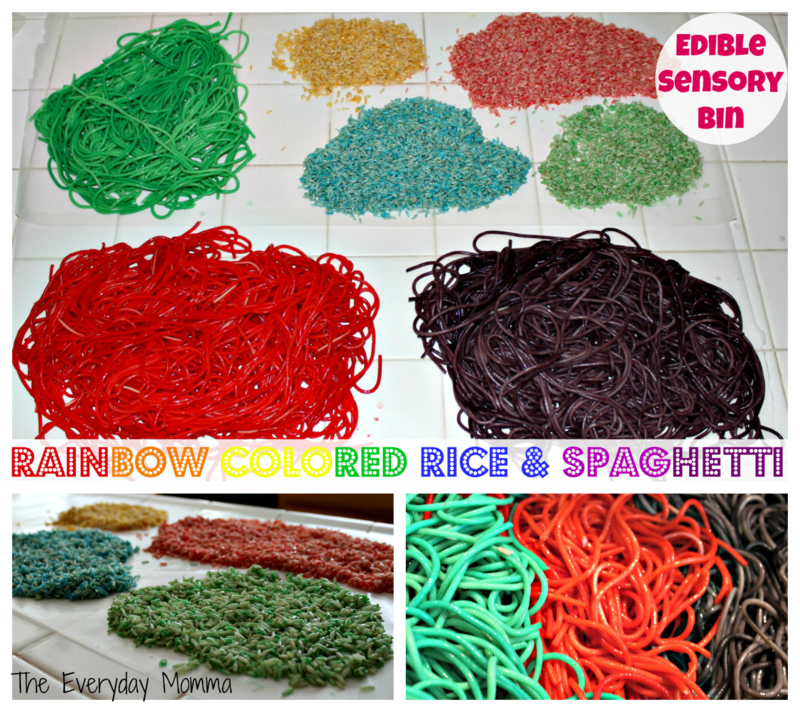 The next morning, drain all of the rice and spaghetti. The easiest way is to use a colander. DO NOT rinse. Once they are all drained, lay them out on wax paper/foil to dry. I let mine dry during the day. By night time, the rice was still a little damp, but that didn't really effect anything. First I started with the ice cream cones. While they were still in the bag I crushed them. I used four of these bags. Top Left: I placed the crushed sugar cones along the outer part of the bin. Then I added the waffle cones. I crushed a couple of them, but I left the majority intact so Myles could scoop and build with them. Top Right: I added the spaghetti, keeping the colors separated and some cheerios. Bottom Left: I added the red and blue jello, some big marshmallows, and the rice. I tried to prop the cones up and put the rice in them, but a couple of them kept falling over, so I just put the the rice around the cones. I also put a couple rice cakes in there. Bottom Right: I laid out some rubber mats in our backyard and placed the bin on top of them. Myles knew exactly what to do! Testing out all the yummies. I knew he would love the jello, but I didn't think he would try anything else... I was so wrong! This is my favorite! He did not hesitate with the spaghetti. He grabbed it by the handful and shoveled it into his mouth several times. 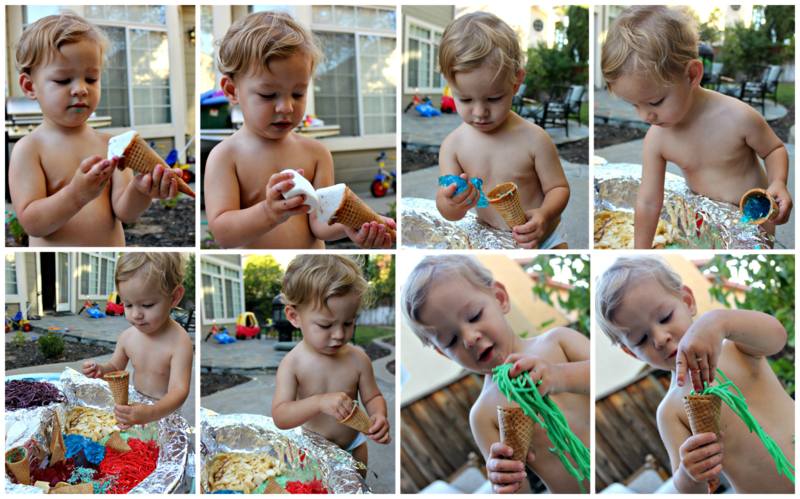 Once I showed him he could put stuff in the cones, he had to test out everything; marshmallows, jello, rice, and the spaghetti all got stuffed into an ice cream cone. Lastly, we built. We tried to make towers out of the food. It was a little challenging, but we did manage to stack a couple things. And then.. this happened. He decided to throw the spaghetti on the ground and stomp on it. Apparently it was so much that he had to do it over and over again! I tried to stop him at first, but then I just said whatever and let him have his fun. I was able to throw most of it away by picking up the mats and dumping the debris in the garbage. The bin clean up was a breeze though. I just wrapped up the foil and threw it out! It was really neat seeing him try everything. He was hesitant at all and was really adventurous with all of the foods. I was very surprised at how much he interacted with this activity. I could definitely tell that it got his little brain working and really awakened and engaged his senses. 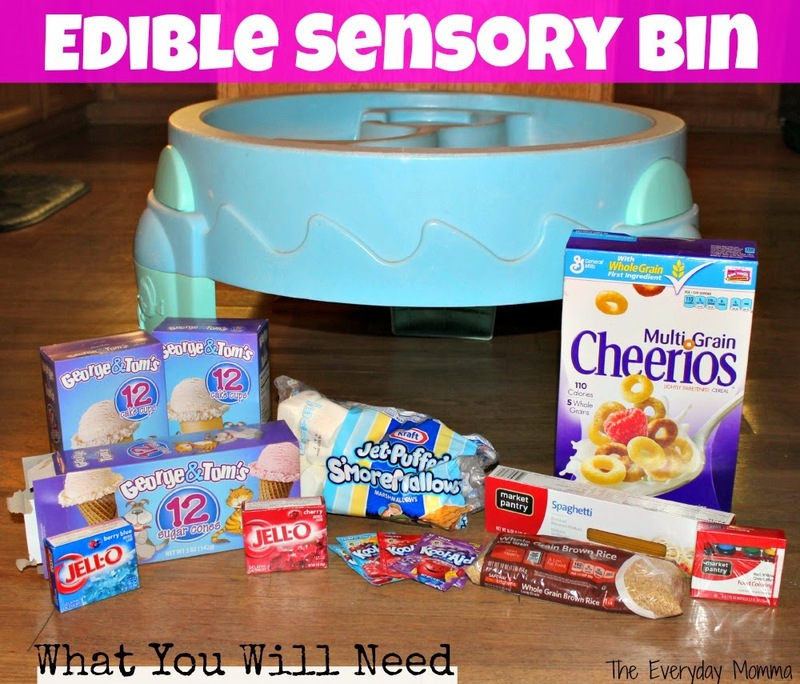 Thanks so much for checking out week five of the Think Outside the Toy Box Summer Fun Series! Also don't forget to check out what all of the other ladies put together for this week's item in the link-up below. And if you have a post (new or old) that you created showcasing ice cream cones in a kid's project, craft, game, experiment, etc., submit it below as well. No post this week? No problem; join us next Monday when we will be using pool noodles!